Dr. Peele is an Avian Ecologist based at the Conservation Management Institute at Virginia Tech. She recently obtained a PhD in Ecology and Evolutionary Biology from Tulane University. 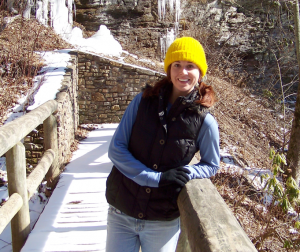 Her graduate work focused on the relationship between habitat quality and intrinsic population dynamics in regulating populations of the American Redstart, during the non-breeding season. As part of the Smithsonian Migratory Bird Center research program, she spent five years studying these and other migratory warblers in Jamaica. Prior to this, she received her BA in Zoology from Ohio Wesleyan University and worked on many other bird reseach and conservation programs all over the United States. In order to educate and inform folks about the upcoming VABBA2, she is visiting bird clubs, Audubon chapters, and other environmental groups around the state. If you are interested having her speak to your local chapter, please contact her at ashpeele@vt.edu. For over 20 years, Kurt has visited a range of locations to see birds. The hobby started during a lunch when his post doc described birding exploits in Nokesville, VA. Soon after he got hooked when observing a Blue-gray Gnatcatcher for the first time. The hobby quickly got out of hand as the drive to see more species became … well, obsessive! Fortunately, his job as a research physicist kept him somewhat grounded, channeling energy into closely aligned directions such as compiler of the Fort Belvoir CBC, board memberships of the Friends of Dyke Marsh and CVWO and organizer of a few field trips. Recently becoming involved in VABB2, he seeks to learn more about the importance of habitat in avian breeding. John has lived in Virginia since 1980, the same year he and his wife joined the Augusta Bird Club. He’s been active in the VSO for several decades and has participated in many breeding bird forays and coordinated the 2003 Bath-Highland foray. He’s a member of the VSO conservation committee and has served as VSO president and VARCOM reviewer. 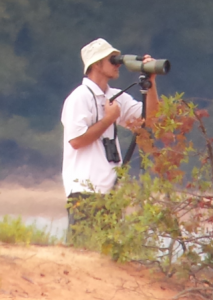 He has been a regional eBird reviewer for several years. John is a retired physician and an incorrigible international traveler/birder, who, when home in Virginia, divides his time between Staunton and Highland County. In Highland he’s been studying Eastern Screech Owls for several years. Lisa Perry grew up in the mountain forests of West Virginia, and from an early age was captivated by the natural world. 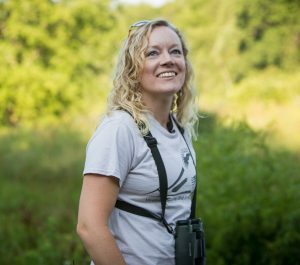 She worked as a field ecologist for 5 years in various locations in Virginia, West Virginia, Ohio, and Illinois, focusing mainly on avian ecology. During this time, she worked as a field technician and regional coordinator for the Ohio Breeding Bird Atlas for two seasons. She has a degree in Environmental Science from Mary Washington University and a Masters of Urban and Regional Planning from Virginia Tech. 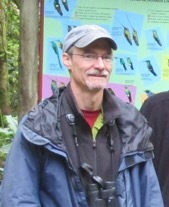 Mike Stinson started birding in Virginia in 1977 and has birded across the US and in several nations in Europe, Africa, Central America, and South America. 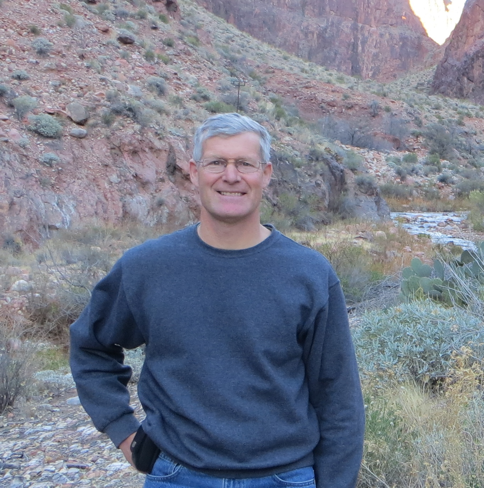 He has served on bird records committees in Kentucky and Virginia and is a Virginia reviewer for eBird. Mike did his undergraduate work at William and Mary and earned a Ph.D. in environmental biology at the University of Louisville where he studied bird systematics and ornithological politics with Jon Ahlquist and Burt Monroe. He also has graduate degrees in theology and communications and teaches college classes in biology and humanities. Mike is an active county lister, maintaining lists for every city and county in Virginia (that’s 133 of them), and is completing a book-length work on the birds of Prince Edward County. 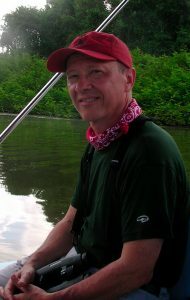 Mike is a life member of the Virginia Society of Ornithology, which he first joined in 1978. Besides birds, Mike is interested in ferns, lepidoptera, odonates, and crayfish, and enjoys hiking, caving, mountain climbing, and good coffee. Ellison is a Field Zoologist for Virginia’s Natural Heritage Program where he works to locate and conserve rare animals across the state. Ellison was born and raised in Richmond, Va where he gained a love for the wildlife of Richmond’s James River Park System. Ellison studied Wildlife Science at Virginia Tech before beginning his wildlife conservation career by traveling the country as a seasonal biologist and educator. He worked on offshore survey vessels in the Gulf of Mexico, monitoring marine mammals and bird migration. He lived among the redwoods of Northern California introducing underprivileged youth to the natural world. Later, he spent a summer surveying Montana’s Rocky Mountains to document non-game species distributions. Three seasons as a birding and naturalist guide for Mass Audubon on Cape Cod further cemented him as an avid birder. Ellison has “settled down” in Richmond where he enjoys urban birding and breweries. He’s active on the Richmond Audubon Society board, a voting member of VARCOM and a regional eBird reviewer. 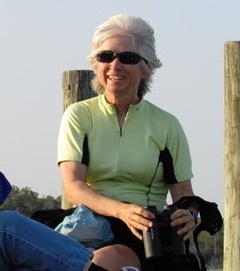 Sue Rice worked for the US Fish & Wildlife Service for 35 years and retired in 2014 from the position of Refuge Manager at the Eastern Shore of Virginia National Wildlife Refuge and biology coordinator of the Chincoteague NWR. She has been happily volunteering and traveling since retirement, when she agreed to assist as the Eastern Shore Breeding Bird Atlas Coordinator. 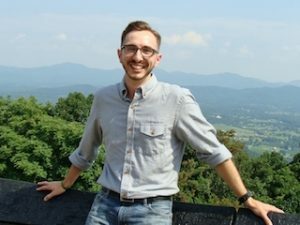 Zak Poulton is from Bristol, Va. After graduating from Lees McRae College in Banner Elk, NC, he has traveled the country working on various avian research projects. Many of these projects took place on the Eastern Shore of Virginia where he now lives and works for The Nature Conservancy as a Coastal Science Specialist. Zak is also the Southwestern Regional editor for Virginia Birds. Dr. Hopp received his PhD in Animal Behavior from Indiana University and has studied vireos and animal communication for over 25 years. He has taught Ecology and Ornithology courses at Emory and Henry and University of Arizona. Currently, he teaches wildlife and sustainable agriculture courses in the Environmental Studies program at Emory and Henry college. He served as regional coordinator for the first Virginia Breeding Bird Atlas and is pleased to be part of VABBA2. Region 8 is in need of a new volunteer coordinator. If interested in volunteering to help out in this region, please email Dr. Peele! As a child, Paul took an interest in the birds that attended the feeders in his yard. While his Mother was not a birder, she always enjoyed watching the birds and maintaining the feeding station. When Paul was approximately 10 years old, a friend of his Father who happened to be a birder encouraged him to begin identifying the birds he observed. Paul asked for and received a field guide as a birthday present, and has been hooked on birding ever since. For the past decade he has birded actively, annually running a Breeding Bird Survey route and participating in Christmas Bird Counts and regular outings in his corner of Virginia. As with many birders, work and family keep him from getting out into the field as much as he would like, but he looks forward to participating in the upcoming atlas project. 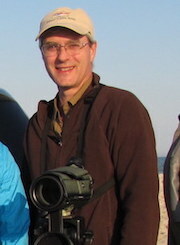 Lewis is a member of the computer science faculty at the University of Richmond and has been birding central Virginia for more than 20 years. He is past President and current Treasurer of the Richmond Audubon Society and Treasurer of the Virginia Audubon Council. Citizen science is an important component of Lewis’s birding activity. He is a long-time eBirder, and a participant in a number of monitoring studies including the Audubon Christmas Bird Count and the U.S. Geological Survey’s Breeding Bird Survey. Evan has been an outdoor educator since 2006 which is around the time he started seriously birding. Since 2012, he has been working in Virginia State Parks and is currently the Park Naturalist at Holliday Lake State Park in Appomattox County where he is in charge of interpretive programming. He lives nearby in Farmville and mostly birds in Prince Edward and the surrounding counties, with an occasional overnight trip to other parts of the state. Evan is also the Vice President of the Margaret Watson Bird Club, the Bird Lecturer for the local chapter of the Virginia Master Naturalists, and participates in as many bird counts during the year as he can fit into his schedule. 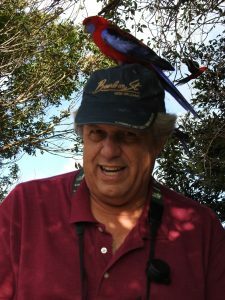 Dave Youker resides in Yorktown, VA and is the president of the Hampton Roads Bird Club and vice president of the Coastal Virginia Wildlife Observatory. He serves on the board of Virginia Society of Ornithology and is a certified Master Naturalist with over 2500 volunteer hours. 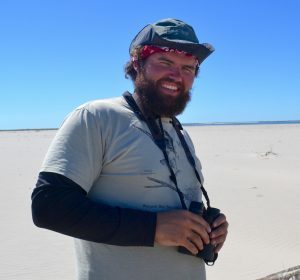 He serves on various teams conducting avifauna population and breeding surveys around the Hampton Roads area and monitors nest boxes for Eastern Bluebirds, Prothonotary Warblers, and Wood Ducks. 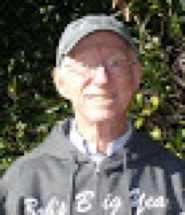 Bob came to Virginia in 1969 as a Chemistry professor at Old Dominion University and has been birding in Virginia, around the country, and the world ever since. Bob is now retired and devotes his time to many bird monitoring and conservation projects. For many years, he conducted two Breeding Bird Survey routes, shorebird surveys at Eastern Shore NWR, beach and impoundment surveys at Back Bay NWR, marshbird callback surveys at Back Bay NWR, and bird walks at Great Dismal Swamp NWR. Bob has organized and led bird trips throughout the United States and around the world including pelagic trips from Hatteras NC. Additionally, he assisted with the first Breeding Bird Atlas in Virginia and is a past president of the VSO.